Adelaide - Australia have named Shane Watson and five pace bowlers, including Mitchell Johnson, in a 14-man squad for the third and final Test against South Africa in Perth after drawing the second Test in Adelaide on Monday. Australia captain Michael Clarke said Johnson, along with uncapped quicks Josh Hazlewood and John Hastings, would all come under consideration for the Perth Test starting on Friday, with James Pattinson ruled out with a rib injury. Pacemen Peter Siddle and Ben Hilfenhaus, who toiled in baking heat in nearly five sessions of cricket during South Africa's second innings at Adelaide Oval, would also be no certainty to recover in time, potentially opening the door for the back-up pace bowlers. "As you've just seen Hilfie and Sidds have had a really heavy workload and bowled a hell of a lot in the last couple of weeks in both Test matches," Clarke told reporters. "I think we need that option once we get to Perth to see how the boys pull up." Rob Quiney, who batted at number three in the drawn Brisbane and Adelaide tests with all-rounder Watson sidelined with a calf strain, has been dropped for the final Test after failing with the bat in three successive innings. 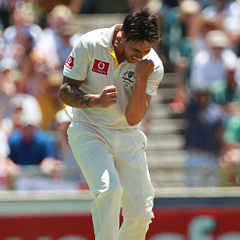 Quiney scored nine in Brisbane and a pair of ducks in Adelaide, making Watson an easy choice for selectors. Despite dominating the Adelaide Test and having South Africa reeling at 45-4 shortly after tea on day four, Australia managed only four more wickets as debutant Faf du Plessis scored a defiant century to secure a draw on the fifth and final day.